What an adventure this semester has been! I have learned so much about blended learning, about tools for my courses, about learning management systems, and about what the future of education could look like with blended learning at the forefront. Thank you all for the support and the knowledge I have learnt from each one of you. Well, another course in the books – almost anyways! To say that I have learned a lot this semester is an understatement. I think the most important thing I can take away from this course though is my mindset towards blended learning in the classroom. I have changed the way I view myself as an educator and I am constantly questioning and considering how I can make my courses more accessible for students as well as more manageable. How can I help my students become better learners in this ever-changing world? And how can I help them “re-find” their creativity and allow them to challenge what education looks like? As I stated in my previous blog, I did not consider myself a “blended” educator before starting this course, even though most of my material has been accessible to students through Google Classroom for the past year. I didn’t think this made me a “blended” educator until other teachers in my school and even my admin mentioned to me what a great idea this was. I also ran into the curious problem of students not attending class due to some health related issues, BUT completing all work and communicating with me via Google Classroom and Remind. This happened for the first time last semester and I was immediately frustrated by it. I discussed it with my admin who asked the simple question: “are they meeting the outcomes?” I thought about it and while the student was missing out on what I thought as valuable instruction, conversation and socialization in my classroom, they were completing the required assignments, and therefore meeting the outcomes. It wasn’t as enriched as I wanted it to be, and I was left with a feeling of disappointment for the student. I wanted them to do better, because I knew they could have excelled in the course if they had only come to class, but this was their choice, and this was how they met the criteria to ultimately graduate. I have the same issue occurring this semester with the exact same circumstances. This student just doesn’t want to be here (at school) because they would rather do the work in their own space. This semester, I had a conversation with the student right away because I understood where this was probably going to end up going. There are some extenuating circumstances to the reasoning of this student not coming to class, and I cannot help but admire them for the tenacity to complete a core class (ELA B30) completely on their own. I should also mention that their knowledge on the subject matter we discuss in class exceeds some of the other students without even being there for the conversations, as well as they have yet to miss a deadline and remain in contact if there are ever any questions. This whole circumstance leaves me stumped and in a predicament about blended learning as well as how to control attendance. Do I cut off their access to Google Classroom? Stop posting all the material and subject matter so they have to attend? Do I introduce the idea of “flexible attendance” to all my students? Any opinions are welcome! be flexible and there are a variety of ways for students to meet the outcomes necessary to graduate into a world that is filled with other types of technology and opportunities. My AP Calculus class is working their butts off to write an exam in May, but I cannot get some of them to invest their own time into the course. I want this course to be blended and I want them to be able to learn on their own. These students, after all, are the ones bound for university and need to learn these skills like time management and independent study. I then look at my ELA courses, where I want to focus more on what we do in class, and the opposite is occurring. I think it might be time to focus more on what my students need and directing it that way instead of where I want them to go. We all know letting go of control as a teacher can be a scary idea! This is one way this course has helped me. It is helping me find where I need to direct my attention and knowledge when it comes to blended learning. Helping me recognize opportunities to incorporate it more seamlessly instead of forcing it. Another important concept from last week’s discussion is the idea of teaching empathy and citizenship. I don’t think schools will ever be replaced completely by technology for these reasons. Our world would not be a good place is everyone was stuck indoors, on their computers, learning by themselves. Students need discussion, they need socialization, and they need to learn important concepts like citizenship to be successful in our world. I think it is really important to teach digital citizenship, and 21st century competencies, but those things don’t mean much if we don’t teach people how to be good humans first. After reading Amy’s blog post this week, I reflected on why I became a teacher, and it was to build relationships and connections with students so that I can help them figure out their teenage years and beyond. If students don’t come to class, don’t socialize with each other, learn how to have important and appropriate conversations with others besides their best friends and families, I think our world will look very different. Students learn coping skills, how to interact with people they don’t get along with, how to deal with controversy and conflict, and figure out things about themselves they never would unless they were placed in an environment like a school from a young age. These discussions and conversations with students are the reason I became a teacher! I love watching the “ah-ha” moments, and the impromptu life lessons that appear in the middle of the lesson, and the laughter that comes with some of these discussions. I would miss these so much if education became purely online, and those are the reasons I think it never will be. Those moments are lessons are too important to miss out on. To close, I have really learned a lot through this course. I’ve picked up some tips and tricks to enhance my blended classrooms and figured out how to incorporate it more seamlessly into my everyday teaching using things like Flipgrid, goFormative and Socrative. I have also learned to make adjustments to my classrooms to accommodate more types of learners that before a blended platform would have simply been written off. I’m excited to see where these new ideas I have learned this semester take my future classes and where education will go in general. The most important thing though, will always be making connections and figuring out how to reach more students, creating more opportunities to showcase how they learn and what they need to learn. This semester we were tasked with creating an online course prototype and I am pretty proud of what I accomplished. When I began this course I didn’t necessarily think I taught in a “blended” classroom, but with my use of Google Classroom increasing every semester, I realized quickly that I actually do use forms of blended learning in my classrooms all the time, mostly for simple things like posting extra videos, notes, or assignments so students have the opportunity to access information when they are absent from class. I thought this would be the perfect opportunity to take a course I am already teaching and make it even more blended. This is why I decided to create a prototype for my AP Calculus course. I also knew I wanted to use Google Classroom since my students are so familiar with it and our division encourages its use. You can check out my course profile here for more details on how I laid it out for the semester. I thought this course would be perfect because I see my students every day for a total of 60 classes before they write the big exam in May. This gives me an opportunity to use the LMS of Google Classroom to enhance our time together and create more opportunities for learning online. This will also help my students become more independent learners, which is incredibly important for their next years in university because they will all be headed in that direction. I began my course with the idea in mind of using a flipped model of instruction. My students actually quite enjoy this model, but others do struggle to commit to the video lessons in their downtime. It’s been a balancing act so far but I have used them as my guinea pigs for a couple of different assignments. I wanted to use a flipped model because I knew it would open up more time for questions and for working through problems together in class which is really what my students need. One of the suggestions on my peer review was to create a place for students to communicate with each other, so I introduced a question and answer Padlet in hopes that students would freely contribute to questions and supply answers to each other instead of relying only on me as their source of information. If you want to see more about how my classmates’ reviews influenced my prototype, check out this blog post. For the modules I created for this class, I wanted to focus more on simpler concepts (things my students would be able to learn from a video as well as hopefully not be too overwhelming for my peers in this course)! I think I selected the right material and I have to say I learned a lot about myself as a teacher through this process as well. Last year, I was made to focus solely on content. Teach myself, teach the students, move on to the next idea. This year, I am much more relaxed and have been able to play around a lot more with my lessons and build new connections with the material as well as preparing my students even more for the exam. I can look more into Khan Academy, create more formative assessments, and know better what my students need. Both my modules run the same way with an intro video as the notes using Screencastify and SMART Notebook. I knew I wanted to create short videos and have students follow along with notes where they could record the information. This also allows them to go back, pause the instruction, and re-watch if they need to. Then there is practice, which is a handout assignment with an answer key. Finally there is the formative assessments which I varied from each module. I think I gave ample practice and I even tried to implement some different formative assessments in Socrative and GoFormative. If you feel like testing your math skills, try them out on my course! The Google Classroom code is wnn06j and you need to log in using a Gmail account. Feel free to check out the rest of my prototype as well including videos, assignments, and practice problems. Also, feel free to check out my course walkthrough if you would rather a quick feel for my course prototype. I think the reason I don’t remember a single topic in those classes is because the discussion forum was always extra. It was additional work, instead of the discussion centering around ideas and questions, and FINDING the answers through readings and textbooks, we read first, and then added points about what we found. I agree that it should be the other way around. Fuel the discussion with ideas and supplement with resources! So I began thinking of ways I could encourage more student-student interaction online. They collaborate daily on problems and assignments so it would be nice to extend it onto Google Classroom. I think I will start with encouraging them to post their questions on the class stream and allow other students to reply with their ideas for answers. To get this started, I might even post a couple of questions for them to work through online and to post their ideas on how to solve the problem, and not necessarily post the answer. I also really like the idea of using Padlet for students to work through a problem together or even start a community where they can ask each other questions about the assignments and problems so that they do not have to ask me first. The beauty of Padlet is that they can post descriptions, write something, take a picture or even insert a video or audio for an explanation or question. What do you think? Will it work? I really think it would be a good example of the three phases: idea generating, idea organizing, and intellectual convergence that Alec discussed with us last week. Hopefully I can get my students to go through all three phases with this idea! A screenshot of my new addition! Another idea I might try since explanation and justification is a huge part of the AP exam is Flipgrid. I might try getting students to answer a problem verbally and explain how they arrived at their answer, as well as justify how they know a certain answer is correct as many questions give the answer, and the student needs to justify why it is correct. I think this would be a great opportunity of students to discuss their reasoning and ideas of problem solving and for me to evaluate their reasoning skills for the exam! This could also work as an assignment to show me how they walk through problems. It might help me figure out their thinking and understanding more, as well as help them discover the important concepts in the problem at an individual level. I know that student-student interaction is incredibly important, and I am hoping I can get my students to buy into the online discussion ideas. If not this year, hopefully next year. In the meantime, I will continue to try, and keep up with my ever-present student-teacher interactions via Remind 101, and the comment section on Google Classroom! As the Bates article stated clearly, “with online collaborative learning, the aim is not to replace the teacher, but to use the technology primarily to increase and improve communication between teacher and learners, with a particular approach to the development of learning based on knowledge construction assisted and developed through social discourse.” This is what I aim to do, and hopefully make more connections between my students, and help them become stronger advocates for themselves, and better learners. This week, we were tasked with reflecting on the feedback from our peers and I was looking forward to hearing some ideas and opinions on how to improve my course. As I am actually teaching this course right now, I have a very specific set of students in mind which may have prompted some of the inefficiencies in my course profile and my course shell. There is also the email login conundrum that has caused some frustration among us all while attempting to “become the student” and evaluate each other’s courses. In order to really take the feedback from my peers: Dean, Sapna and Michael (thank you by the way for the awesome and positive feedback! ), I feel like it is appropriate to address some their questions here, as well as provide more insight into how I am running this course. We all do that thing where we think we include information or it is completely obvious to us, and think it, but do not disclose the information that others are wondering about, so without further ado, here is a little more information about my blended learning course, AP Calculus! I started teaching this course at the beginning of Semester 2 this year. I taught the same students in the first semester, teaching them Calculus 30. I have built relationships, trust, and communication with all of them and I currently have a class of 14 students. We establish on the first day of semester two, the expectations for the course and what THEY will have to do in order to be successful. We talk about the exam date (May 14th, 2019), and decide on practice exam dates as well, which this year will take place on April 17th and May 7th. We also discuss that we have 61 hours of class time until the exam which of course, terrifies them and myself! One of the comments I received for feedback was: The “timelines of the course (for all AP courses) would be a concern – there is a lot of topics to cover in a short period of time.” You are not wrong! And this is why I decided that a blended learning atmosphere would be the best idea for my students to be successful. I see them every day, for one hour and it does lighten the load that half of the material has already been covered in Calculus. I now, go back through concepts they have already learned and add more insight, clarification, and more complex theorems and ideas to the units we have already looked at. It is a lot of material to cover, and a lot of the work, assessments, and practice needs to take place outside of my classroom hours. For example, both practice exams are written after school hours and much of the homework assigned needs to be done on their own. This is why I thought the blended learning model would work so well; if I could flip it and give them lessons to watch and focus on the questions the need answered in class, they would be more successful than my first bunch! I already see a difference!! It’s working and my students are less overwhelmed by homework and material they need to study. Another great question from my peers was: “Are there ways students can connect with each online to review content?” I never thought of this! Students can post questions and ideas on the stream on google classroom, and I am thinking of including a Padlet on the stream where students would be able to post their questions, pictures of work, as well as communicate with one another about the topics. Does anyone have any other suggestions for student communication for outside of the classroom? Again, a reason I never considered this need was because I do see these students in class every day, and because it is so implicit for me, my students also communicate with me through Remind 101. I have many that will ask me questions after hours, and I can send out reminders for quizzes and homework problems I want completed. We also frequently break into groups in class to discuss problem areas with questions which allows them to solve each other’s problems and they have come to expect this, so they do not frequently ask questions outside of class because they understand this routine. I think it is also important to note that this course is not asynchronous, and so the online platform is there to support student learning, and provide more insight, but it is not a substitution for being in class. This is very different than other courses I evaluated last week, because many ran like an online course. There were no gaps, and everything was accessible through the online shell. This is not what I wanted for my course, and I think this is the difference between some of the feedback I received compared to other courses. There will be gaps in my model and not everything will be available online because I see my students every day in class, and I want it to be blended in this manner. I do not want my students to be able to complete everything online and have no need to come to class anymore. Certain pieces need to be done face-to-face. I am actually struggling with this concept in my ELA B30 courses, where I have an established blended learning environment with Google Classroom. Everything can be done and handed in online, so sometimes, students don’t feel the need to attend class, which can be both a blessing for them and a frustration for me. I see it as a double-edged sword, and I do not want this to happen in my AP course so the gaps will remain for now! Another consideration from my peer-assessors was that “there doesn’t appear to be any consideration for student access and accessibility for this course.” I also did not address “common concerns like low bandwidth, student access to devices, EAL learners, cultural considerations, socioeconomic status” in my course profile. I did address these issues in my profile to some extent, but it is not explicit for those who do not know my students. That is my fault and I plan on changing some of the wording in my course profile as a result. I know my 14 students very well, and I created this course profile with these students in mind. Of course, I will have to make adaptations from year to year but I am very lucky with the group of intelligent, talented, young adults I have this year. This experience so far as been nothing short of incredible and I absolutely love teaching all of them. My 14 students all have cellphones and internet access at home. Of course, we have devices at school students could use if this was an issue, as well as support for low bandwidth. My students have spares and can access these devices before/after school, in spares, during class, and at lunch. Due to the rigor and level of the course, EAL learners will have a strong English language background in order to get to this point so this is not technically an issue I need to address in my classroom currently. Again, if I needed to, I would adjust my material, offer extra support, and allow Google Read and Write to be used. However, because all these students will write the same exam in May (in English), with the same expectations and little to no support during the exam, I try to mimic these expectations during classroom assessments. I am not even allowed in the exam room or to talk to my students about it for 24 hours after they finish the exam! Every student will write version 1 or 2 of the same exam, all over the world and my students need to be prepared for this assessment adequately. I have a variety of cultural backgrounds in my class and I love the diversity of it which allows for some great conversations and different perspectives in my course, but at the end of the day, the only assessment that matters will be the same for everyone around the world and I try to prepare my students for that. I really appreciate the feedback I received from my peers this week and it gave me some great ideas for continuing to develop my course! I’m going to look at creating more time in my videos for pauses, create more effective assessments on Formative, and construct some way for students to communicate when they are not in the classroom. Overall, I am happy with how my course is developing this semester and look forward to working hard to make it more polished in the coming weeks! Hello fellow EC&I 834ers! It’s been awhile! Time to shake off the cobwebs on the keyboards and get back into the blogging spirit! This week, Alec’s prompt stumped me at first: “Take this week to read about/explore an aspect of online/blended learning that you are interested in, and then blog about it. This might include your thoughts/reactions to a particularly interesting article that you find, your own exploration of a mode/format/strategy for online/blended learning that we haven’t touched on, or your further research into a course topic that interests you.” What do you mean I have to explore and think about something that I am interested in learning more about? What do you mean there is no direction to this week’s blog post? I had to stop and think. I had to spend some time exploring the world wide web. I had to figure out a direction and go with it! Now, for those of you that have ever done the “team-building” personality test where your personality becomes a shape, I’m a square. I don’t do well when there is no direction. I like consistency, I like having a prompt, and I will complete the task, most likely in one shot because “chunking” and “working slowly on an assignment” has never been my cup of tea. I procrastinate, and then I panic, and then I produce something pretty great that would have been a lot less stressful if I had started ahead of time, but it had to be the perfect idea before I began. I digress. This personality of mine led to some colleagues of mine, namely Brad Raes and Logan Petlak, and we discussed some ideas for directions in this blog post. From there, I hit the internet and decided I should watch at least one TED Talk because they are my favourite things to learn from so I found this one! I liked it. What is your mindset and the mindset of your students? I think these questions are an excellent starting point, because they make you think about what your purpose of using blended learning is and if you are truly looking to change your perspective and teaching theory in the classroom or just looking for a quick fix. Markoff goes into detail explaining what these questions entail, and how difficult, time-consuming, and complicated it really is to integrate these ideas into a classroom. It takes hard work, it takes trial and error and most of all, it takes time. She mentions that many classrooms and schools tend to fear this idea, and do not want to fail with a model and so when it needs adjustments, it is simply thrown out and the old model comes back in. It made me think that this blended learning idea might be more complicated that I originally thought. It’s not something that is going to be perfect the first time around, and it is going to take a lot more research and development to work out just right. Now what I noticed as I read the article is that overall, every type had the same thing in common. They are blended learning ideas and they involve technology as a way to support student learning. It seemed intimidating but was far from it as I continued. The rotational models have my interest peaked mostly because I feel that this would be a fantastic goal for my AP Calculus students. I would love to do sections of direct instruction, sections of a flipped model, group work and individual assessments online. Students could work at their own pace, and work more on the concepts THEY struggle with because at that level, what my students need is practice and motivation. I believe this model would provide some of that! TeachThought defined “Station-Rotation blended learning is a: “…model (that) allows students to rotate through stations on a fixed schedule, where at least one of the stations is an online learning station.”” This is commonly used in elementary schools, but why couldn’t it be successful in a grade twelve classroom too! I already do certain aspects of it, and students learn more from experiencing the skills themselves than from me explaining a complex theorem to them directly. Once I read more about this idea, I knew it was familiar from the elementary idea of “stations” but this is more complex, using a variety of strategies and tools to teach concepts and ideas to students, on a fixed schedule, which I already have, but in their own way. “Students learn using software or other online-based coursework on classroom computers. Students can do a variety of activities, including but not limited to previewing, completing, or reviewing skill lessons, reading stories, or taking computer-administered assessments. Through these kinds of tech-based activities, students have opportunities to work independently and privately, free from concerns about how they will perform in front of their peers. I see endless possibilities, not only in my math courses but also my English courses for this type of learning. I never thought of using stations as a strategy in a high school classroom but I think it could work and very well! Does anyone else have any experiences using this type of strategy in their classrooms? Does it work with older students like it does with younger students? I am open to suggestions and will keep you updated on my progress with the implementation of my newfound blended learning technique! Hi everyone! I am so excited for another semester and become one step closer to completing my Master’s in Curriculum and Instruction! This is my fifth course overall, and I can start to see the end! This is my third class with Alec, and I’m looking forward to learning even more tools to test out in my courses. I’m also looking for recommended courses to take next year so let me know if any of you have taken any gems lately! I teach at Central Collegiate in Moose Jaw, and am in my sixth year of teaching. Over my short career, I’ve taught a lot of different courses, and have finally settled into my chosen path of senior English, and Calculus. I know, total opposites! But I have loved teaching such different courses and challenging myself to teach in these completely different mediums. Along with teaching these courses, I coach basketball and track and field at the school, and somehow find time to take a course every semester! In my free time, I love reading and exploring this beautiful country of ours with my boyfriend. Since I teach AP Calculus, I am hoping to be able to apply some of the learnings in this class to my own course as I would like to make it more of a blended course! Giving my students the best opportunities to prepare for the big exam is my main priority this year, as well as giving them as many resources as possible. I’m looking forward to learning about different mediums for creating/using online courses to further my students’ learning and my own. Looking at different platforms will allow me to figure out what I like and don’t like about online learning as well as develop my own. I also want to further expand my Personal Learning Network by working with each of you, and exploring Twitter more in-depth. I have a great network already, but I am always looking to expand it because, as I have learned since I started my master’s, that it is incredibly valuable for resources, support, and enhancing professional development. I’m looking forward to the learning journey ahead and connecting with you all more as the semester goes on! If you want to connect on Twitter my handle is @mackeyshelby21. This is it! The end of EC&I 830! I cannot believe how fast this course flew by, and I also cannot believe how much I learned over two short months. It’s amazing the community we developed and how much we were able to challenge each other to grow and learn in such a short time span. It’s been a pleasure to learn with all of you. I loved the style of this course and how it enabled us to be in charge of our own learning. We brought a lot of debate to the table, and I thank all of you for challenging my thinking and opinions. There is no one right answer to any of the topics we discussed and I think that makes this course so great! Without further ado, here is my summary of learning video! Thanks again all for a fantastic class and I hope you all enjoy my video (I had a lot of fun making it)! This week’s debate had me all over the place. Thinking of the phrase: “technology is a force of equity in society” has many sides and angles to consider and there is not one straight answer: yes or no. I found there was a lot of mixed reviews throughout our debate, and many elaborations for our reasons we think it is or isn’t. For example, yes, technology can be a force of equity because it is creating opportunities where they were limited before or no, it is not a force of equity because there is not equal access around the globe. These types of ideas were incredibly important to our debate this week, and I think through a lot of thinking post-debate, I have established that we may not be there yet, but we are working towards solutions for this inequity. The agree side this week did a fantastic job opening the floor and I found myself agreeing with all the points that Jen, Dawn and Sapna shared. Their major points included the removal of barriers in education and skills, the use of open education resources creating equality through education, and then focused on the idea that the corporate system is the reason that technology is inaccessible for people in a lower socio-economic status and not the tech itself, and not the tech’s fault itself, showing that the tech isn’t creating inequity, but people by making these devices which have now become a necessity, cost too much money to afford. The disagree side of Amy S, and Rakan countered well including some important ideas I would have never thought about in my internal debate. Their main ideas circled around tech creating bias, gender abuse, and racism online, as well as digital colonialism and economic inequality. As a said before, I found myself agreeing with all the points the agree team shared. I see technology remove barriers all the time in the classroom. I actually once saw a two men sitting at Tim Horton’s using their cellphones and a translating app to communicate with their voices and have a real conversation. It made me so happy that technology has been able to reach a point where we can communicate with one another and create friendships with people that do not necessarily share a common language. As for the classroom, I know I would have been in a real bind if I did not have my technological resources for teaching. I have taught A LOT of different subject matter and without open resources and the World Wide Web, my knowledge would have been much more limited as well as the material for my students would have been much simpler as I would be scrambling for activities and ideas on my own. For example, my first year I taught Law 30. Where did I turn but to the internet to find different ideas and resources to help supplement the material. I even found an activity to look at the laws often broken in different fairy tales and create a trial for the characters. Would I have been able to come up with this idea without technology? No way! It helped make my life less stressful and created equity in a situation where I was at a disadvantage. There are also many assistive technologies out there to help students including Google Write&Read. Many students struggle with getting their ideas on paper and these types of apps help create an equity in the classroom so they too, can reach the outcomes of other students. However, access to these apps can be difficult if you do not have access to the technology which is what the disagree side countered. Cost is a major downside to education as well as creating equity in the classroom. And like Amy R. said in her blog this week, Technology should be accessible to everyone because it has become essential to live. It has become a basic human right to be able to access this information and these devices yet corporations will not lower the price on devices, making it difficult for people of a lower socio-economic status to get access. People may argue that there is free access in libraries, and schools, but not everyone has direct access to a building like that. Sunny Freeman’s article states that even in Canada, only 62% of low-income quartile has access to the internet and it is difficult to dispute. Have you ever gone camping in a rural/northern part of Saskatchewan? Little to no internet access or even service exists! So like, the agree group said, we can fix this! We just need to lower the costs on devices, and create more opportunities for access in order to lessen the digital divide felt everywhere in the world, not just Canada. Daniel also made a great point in his blog this week: “Some affluent people thus think by simply dumping the highest tech in the poorest places in society, inequality will be solved.” This will not solve our problem when there is no education to help those educators or students use the technology and unlock its potential for the classroom and for their future. If we are going to increase technology use in the classroom, we need to also increase the professional development and resources for teachers to USE the technology as well. I think it is super important that if we are going to increase technology and use programs like One Laptop Per Child, they need to be used appropriately in order to avoid digital colonialism which is what Amy and Rakan hinted at in their opening video. It’s a very thin line between introducing and advancing a third world country and pushing Western beliefs on an already established society. For example, in this article, Facebook is offering free internet to places with low economic status but with a catch. “Free Basics is a Facebook-developed mobile app that gives users access to a small selection of data-light websites and services. The websites are stripped of photos and videos and can be browsed without paying for mobile data. The catch is that they cannot access all the internet, only a few select sites and they need to pay more for more access. This in my opinion does not create equity, but increases the divide showing “you can afford this” or “you can’t afford this.” This idea is also restricting language, with the majority options being only in English, and if that’s not a Westernized view/Digital Colonialism, then I don’t know what is! Dhanaraj “Thakur believes a better solution would be to give low-income groups a limited amount of free data to access the open web” and I agree. Why not? What is the harm? Unless the corporations in charge have a hidden agenda behind enabling these communities with a more Western view. Another solution to the idea of making education more accessible is Open Education Resources (OERs), Massive Open Online Courses (MOOCs), and Virtual Classrooms. Having these types of resources online have created a lot of opportunity for remote classrooms and cities. They may not have the resources physically, but they can access the information online ending the digital divide. Of course, there are still other down-sides that are creating unequitable circumstances like the ideas of gender and racial bias online, and that AI could possibly be racist and learning its racist behaviours from humans, but I hope that we are moving in a positive direction away from these ideas. Lizzie O’Shea stated in her article that technology’s biases are not bad necessarily, as long as we recognize them as such and move towards making these racial and gender roles more neutral. And after listening to both sides of the debate, I couldn’t agree more. We are imperfect, so our tech is imperfect too. As long as we recognize our faults, and are trying to work towards solutions, then I think we are accomplishing something. Is technology creating equity in society? In some cases yes, and in some cases no. Technology is not going anywhere, and it is becoming a more crucial part of life and should be demanded by all of society. It has huge potential to create equity in all walks of life, but it is how we go about making sure it is accessible, fair, and neutral to everyone that is the most important part. When I began this week, I stood firmly on the agree side when the question was asked, “Is social media ruining childhood?” Of course, social media is ruining childhood! How couldn’t it be? Why do I not see children gathering outside? Playing hopscotch? Skipping? Shooting hoops? Riding bikes with their friends? Using their imagination to build forts? Because, social media controls their lives. Click here for 25 things you don’t see anymore; and maybe some nostalgia too! They no longer need to go find their friends, play these games, or use their imagination the way I did growing up, because they have a device that connects them to their friends, their device has the games, and their device allows them to be creative in other ways. Is this entirely a bad thing? No, I don’t think it is. After the debate this week, I had many thoughts on the topic. I thought both sides of the debate did a fantastic job: Melinda, Allysa and Lori has some excellent points that made me nod my head and solidified my idea that social media is ruining childhood. They discussed the rise in anxiety, and cyber-bullying online, as well as the pressure kids feel to fit in, and how many of these problems are because children ignore the age restrictions, and parents are left in the dark – oblivious, or conscious of these decisions. The disagree side is what started to sway me: Erin, Brooke and Daniel made some strong arguments towards the positives of social media, including the idea that it strengthens children’s relationships, creates a community, and they become more aware than children of past generations. After both of these arguments, my original ideas were up in the air. I think the biggest difficulty for me was that I was stuck on the nostalgic idea of what my own childhood was like and that kids today were missing out! There was so much good before technology took over and I remember creating my own fun in the backyard, riding my bike all over town to meet up with friends, the new addition of MSN to my teenage years, and no social media. I grew up in the nineties and I am in awe at how fast things changed. I think I was stuck in the idea that I had the best childhood, so of course social media is ruining now-a-days children’s childhood because they are having such different experiences than I did 20 years ago. Once I got past the idea that children today aren’t missing out; their childhood is just different with different opportunities and different challenges. I think yes, there are a lot of potential risks of over-using social media, and the risk of addiction for teens is very real. I had a couple of grade nines almost cry when I took their phones away for one day for a health experiment. Cyber-bullying is also a very real concern, and it is something I deal with daily in a high school setting. Unfortunately, cyber-bullying is worse than just bullying because it can follow a child home, and follows them every time they log online. This infograph does an excellent job of explaining just how prominent cyber-bullying is, and the different ways it is visible to teens. However, as the disagree team pointed out, the online world can also be a great place for community development and support. When I am teaching about mental health, I always suggest using online resources to find supports if students are struggling but after Monday, it clicked. Students develop their own communities and support groups online for isolation, bullying, gender inequality, racism, etc. and this is awesome!! Another point the disagree team made was that students are able to explore their interests and ideas online, making connections to other students all over the world who are like-minded individuals and all of a sudden, they aren’t alone anymore and I think that is fantastic. Of course, there are risks associated with this idea, like pedophiles profiling and “cat-fishing” young children into meeting up or earning trust to have children partake in risky behavior, however, this is where education is key. Parents also need to be aware of the behavior of their children and not let them loose online. Teach them and discuss social media etiquette. Advise parents to talk to their children and adolescents about their online use and the specific issues that today’s online kids face. The real goal is to help students develop a positive online identity and understand the consequences of posting risky photos or videos online. Just because you do something when you are young, means it will follow you online for the rest of your lives. They need to understand that the things they say and do on social media is permanent and can harm their futures. I think this is also why, as teachers, we need to teach healthy digital citizenship to children from a young age, so that when they reach adolescence, they are better equipped to navigate this online world. On top of this, students are more aware of their country, and the world they live in. Having instant connection to social media and news, things spread fast and they are on top of it. Often students are advocating for causes, researching bias of opinion and using social networking sites to trend important issues like #blacklivesmatter, #metoo, #prayfordouglas, or even something like #humboldtstrong. These kids have power at their finger tips, and once they realize it, things could start happening for our future, and our planet. The Learning Network says, “We’ve become the most tolerant and conscious generation to date, with 76 percent of Gen Zers concerned about humanity’s influence on the Earth and 60 percent hoping the job they choose impacts the world.” I think a large part of this is due to social media, in creating an open dialogue for a lot of these issues, like climate change, racism, gender equality, political campaigns, mental health awareness, and so many more. People are able to connect with others online, and start discussions that matter, whereas in the past, we have been limited to the beliefs of the people around us physically. I think Melinda had a great point, when she said in her blog, “There needs to be a balance, kids need to be kids and play outside, rough house, interact, etc. They don’t need to have 24/7 screen time, they need to be active and imaginative.” And to sum up, I think social media can be a great outlet for children, but it is not the only outlet. Like Melinda said, kids still need to be kids, explore, and develop in the real world, be active and engaged, but I think there are a lot of great things we can expect from this generation as they become more tolerant, and engaged in the issues occurring in our world. This week’s debate really made me think. I started somewhere in the middle; on one side, sharing is a fantastic opportunity for our students to learn important practices, share their accomplishments, and interact with other like-minded people around the globe. On the other hand, sharing can create a lot of issues with privacy, as well as cyber-bullying and consent to use specific photos posted online. This dynamic created a lot of debate in our class this week, and honestly a lot of debate in my own head. Whenever the ideas of privacy laws and practices come up, it can be a very controversial and scary idea. What if what we post is wrong? What if we get in trouble? Can I lose my job for this? There are no shortage of horror stories out there to scare teachers into never posting a single thing on the internet again; class or non-class related. I too, often think and rethink what I share online about my students, which to be honest is very limited. Beyond team, athletic, and grad photos, I hardly post about my students online. Everything remains nameless and it is almost always acelebration of accomplishments. elementary stand-point and teaching young students how to be responsible online. What should you post? What shouldn’t you post? A lot of conversations circled around the idea of parents being super involved with their child’s tech use and also the teacher overseeing the practices. Seesaw, I’ve learned, is a great tool to engage parents and create important conversations with kids at home. This technology is awesome because it can often bridge the gap between school and home life. However, there is the down side of over-involvement of parents and the idea of “helicoptering.” In fact, Robyn Treyvaud states in her article, Dangers of Posting Pictures Online, that “more than 1 in 4 children admit to feeling worried, embarrassed, or anxious when their parents post photos of them on social media,” which goes beyond the idea of hovering or helicoptering. I know many of my friends are having children right now and seriously, the amount of “baby spam” I see in a day is ridiculous and the consequences can be even more serious! It’s something I don’t think my generation really understands, making it even more important for the next generation to comprehend! What parents post, even at a very young age, can affect a child’s mental health later on in life? It begs the questions, do you want the whole world to see a baby photo of you? I think both sides of the debate did a fantastic job of making their case! When it comes to my world in a high school, photos, technology and phones are everywhere. We even have a school Snapchat and Instagram account run by the Spirit Committee, run by a couple of awesome teachers! My students are on their phones constantly; I use Remind 101 to contact students and my athletes for various things like deadlines, practice changes, or just general reminders for the next day. It allows my students to connect me as well without directly having my phone number. I also use Google Classroom for all the students’ homework, assignments, deadlines, and I also used it for Track and Field this year – creating an online platform for athletes to access permission forms, schedules, dates, and results. It worked fantastically and never thought twice about using these online platforms with my students. However, everything I use and do online is “private.” I’m not sharing student photos to the internet, not posting on Twitter about our interactive activities, and although I feel my students are safe because of this, maybe I’m not properly preparing them for the online world? level, students need to be empowered and use technology for good, like Amy said, instead of being the passive “likers” online. Randi Zuckerberg stated in his article that, “technology and the world around us is evolving so quickly that even children a few years apart may experience two very different forms of childhood.” And I think this couldn’t be more true. I know my childhood was vastly different than kids today and even looking at my current students. I graduated high school nine years ago, and THINGS HAVE CHANGED. EVERYTHING HAS CHANGED! I think it’s important that we don’t shut down these differences and instead we embrace them, because if we don’t, they we run the risk of not helping our students be successful in the outside world. Their world is online, and it will continue to be for the rest of their lives. They need to learn how to adapt and post appropriately online and protect themselves. It lends itself to the idea that we cannot protect our students by banning the internet or posting pictures online because what is that teaching them? They will rebel, and in turn post inappropriately online because they were never taught, nor was it modeled for them. I think digital literacy and creating a positive digital footprint is incredibly important for students. What is the first thing their employer will do? Google them. What is the first thing someone just getting to know them will do? Google them. They need to understand that their online identity will exist online whether they want it to or not. If they do not create it for themselves, and twist it into the story they want to tell, someone else will tell the story for them. I think once students understand this concept, the rest becomes more simple than we think. It becomes about education, about what they want a future spouse, family, employer, etc. to see online. There are many dangers to the online world, but the opportunities and positives far outweigh these negatives. “Students are, for the most part, growing up in this digital world without any explicit or universally adopted rules about how to behave, and there is little guidance available to adults. As our digital connections and interactions grow, the lines between our education and personal lives, our career and private activities, become blurred” (EdTek White Paper, 1) and it is our job to help advocate for ourselves and for our students online. I know after this week, I am going to try to be more involved with their online world and help my students navigate it. I feel as though it is my responsibility as an educator to do this much for them and prepare them for their future, and their online portfolio that is all their own and no one else’s. To watch our introduction video, click here! After the debate, I realized there is even more we could have focused on, including the idea of “fake news” and our students’ ability to interpret it, and the idea of curiosity as a skill. I touched on this slightly in my closing statements, but I hold strong on the idea that children and teenagers NEED to be curious! If they are not curious with their ideas, then where is the creativity? Where is the innovation? Where are the skills that they will NEED in the future? The “agree” team posted a video: Knowledge is Obsolete, so Now What? spoken by Pavan Arora and I do agree with them. Some knowledge is becoming obsolete, but not all of it is obsolete. Key math skills, and basic understanding of the English language are incredibly important! And whether my students believe it or not, they will need to add, subtract, create ratios, convert measurements and be able to do it quickly and will not always have the assistance of their phones. Examples of the consequences of bad grammar! When it comes to English and writing skills, everyone will need to know how to properly write an email, a cover letter, and important text messages. You cannot text your boss that you are ill, and send something full of abbreviations and misspellings. Of course, Pavan’s argument goes beyond this. He discusses the idea that children of today, will not have jobs that exist today, so how do we educate them so that they are ready? He states our job is to “teach our children how to access knowledge, how to assess knowledge and how to apply knowledge.” Our group never stated that teachers should not use google or that students should be banned from using it for research. Our focus was to use it with purpose and not simply answer students questions by saying “google it.” Students need to use their critical thinking skills first and develop their own opinions before they start accessing the internet and using someone else’s opinion for make their opinion. Things like facts, should be checked and students need to figure out how to weave the web to find the good stuff, the right stuff and make educated decisions based on the information found. The same goes for memorization. Imagine having a conversation with someone who didn’t know the basics of the discussion and everything they had to say, had to come from google. These ideas of fact checking have their place, but it is much easier if we teach certain skills and basic understandings so that students CAN apply the higher levels of Bloom’s Taxonomy. Memorization is the base of the levels so students need some ideas or thinking critically or innovative will not happen easily! Students always ask me why we have to study Hamlet. I’ve thought about it, and is it necessary, no, but is it relevant, absolutely. I tell my students, what better way to learn than from a story. There are many life lessons from Hamlet that can be applied to the real world, and probably some irrelevant information as well but sometimes a piece of literature can help a student through a situation or they find a quote that really means something to them, and they hold onto it. In a world where mental health is a huge concern and we are trying to advocate for it, I show my students Hamlet – a depressed character who has been through a lot (the murder of his father and the marriage of his mother and uncle) voicing how sad he is, and no one listens. We discuss the importance of listening to each other and helping each other. He even has soliloquys about dying and wanting to die. Some of my students can unfortunately relate to that so we discuss the ideas of suicide and how Hamlet really feels right now. We talk about mental health and the differences between then and now and I would say it’s the most important thing we discuss in my class. And you know what, they don’t forget it. I have students come back and tell me, it is still their favourite Shakespeare play and they still remember the story! Of course, there are also ideas of following through with your actions and thinking before you act; watching the effect you have on others around you, and many other life lessons that are better experienced through literature than life itself (I mean, I don’t think anyone wants to plot the murder of their uncle and see what consequences follow, so probably better to read about it 😉 )I think Shakespeare also helps interpret language we don’t understand, students have to find meaning in it, and it helps them understand bigger ideas, and see how far our language has really come and it’s awesome to watch! This example also leads into our third argument about deep-reading and reading for understanding. Of course, the internet and the process of skimming are valuable skills but so is reading and actually remembering what you read. I know I struggle to focus on the computer, especially for long articles or even books online. If I print them; totally different story! Anyone else?? The idea of reading and understanding is becoming a lost art and I know my students struggle with it. Lots of them turn to Sparknotes or other websites to tell them what happened in the novel instead of reading it themselves which can be really frustrating as a teacher. There is so much more to a piece of writing than just the summary and it can help them become better writers, and critical thinkers if they actually attempt to interpret the writing for themselves. Even looking at the ideas of themes or choices characters make can help them deeply in terms of their depth of knowledge and understanding of other people. In Is Google Making Us Stupid, Nicholas Carr makes an excellent stating, “our ability to interpret text, to make the rich mental connections that form when we read deeply and without distraction, remains largely disengaged” when we are browsing the internet. I think he is 100% correct. I know the “agree” team argued this point stating that it’s a different type of skill we are gaining and I totally agree. And I think it is excellent that we can skim dozens of articles to find something meaningful to use for our own research but I’m also talking about stories and books and those need to be read to be truly understood. Deep reading is a valuable skill and one I’m worried we will lose if we don’t continue to make kids read! What will happen to all the old literature, the beautiful stories, and even our own history if we only skim it in the future? So to conclude, I still think there is a place for memorization and facts in the classroom. There is value in teaching things that can be found on the internet. Do I think we should erase the internet all together? NOPE! It’s not going anywhere and we do need to teach our students to be responsible digital citizens and be able to navigate the web responsibly and effectively for information. It all depends on your purpose. And honestly, if we are teaching students that the first response to a question is to google it, I don’t think we are teaching them correctly. We should let them be curious, think about the answer, find their own idea, and then turn to the internet because that will have more meaning, they will remember the lesson more, and they will automatically think more deeply and critically about the response they found if it contradicts their own. To say that technology enhances or does not enhance learning is a complicated question. We live in the day and age of technology, and as educators, it is our responsibility to teach for the future and that future includes technology. I think a big part of having technology in the classroom enhances learning. This year alone, I have found myself relying more and more on it to help my students learn effectively. For example, with my Calculus class, I was relying heavily on Khan Academy to help supplement my students’ learning. It was my first time teaching it, so there was a lot of “learning together” going on. I was also using graphing calculators and apps to help my students visualize first, and then internalize what certain graphs look like so when it came time for the big exam in May, they wouldn’t even need to look at a calculator to know the behaviors of certain functions. being used as classrooms for majority of the day so booking into one is nearly impossible! We also have two sets of chrome books, which are awesome….but slow. The Wi-Fi is not the most reliable in the school which can render the chrome books almost useless in the hour of time we get to use them. As a result, I definitely do not use tech in my classroom as frequently as I’d like. Using technology in the classroom allows you to experiment more in pedagogy and get instant feedback. Technology in the classroom helps ensure full participation. There are countless resources for enhancing education and making learning more fun and effective. Technology can automate a lot of your tedious tasks. With technology in the classroom, your students have instant access to fresh information that can supplement their learning experience. We live in a digital world, and technology is a life skill. The last one is the most important one to me. Knowing that my students live in a world of technology, teaching digital citizenship is the crucial to their success in the bigger world. With so much access to technology, I love teaching my students how to research properly, how to think critically about what they are reading online, and how to search for things effectively. I encourage them to use sites like Khan Academy (I actually linked it to my Google Classroom this semester, and used their AP Calculus prep course to help my students study for the exam), SparkNotes and No Fear Shakespeare (for when my students miss a reading or just need more help understanding the language) to help enhance their understanding of course content. My favourite is being able to teach the teenagers in my classroom those important life lessons when it comes to cellphone usage. We discussed a lot on Monday about appropriate use of cellphones and how to structure it. I allow cellphones in my classroom, and I often have students working on projects, connecting to my Google Classroom, or reading on their phones. However, I am not naïve that they are “only” doing school work. We discussed the idea of multi-tasking and whether it is a good thing or a bad thing for students. The fact that I teach high school influences my opinion and I believe that they need to learn how to multi-task effectively because as teachers and adults, we are expected to multi-task daily. Of course, I reprimand students for being on their cellphones while I am delivering a lesson, but when it comes time to their individual work time, I allow them to figure out a balance that works for them. As long as they are on task most of the time, cellphones are allowed — otherwise, they lose the privilege. They need to learn for themselves when is the appropriate and inappropriate times for their usage. Ontario Premier Dalton McGuinty stated, “it seems inevitable that some sort of hand-held wireless device will eventually become part of education systems across the country” in the Maclean’s article: Don’t give students more tools of mass distraction, so why not embrace this change? If we fight it, what are we really doing? We are hindering our students’ abilities to be able to use their mini-computers in effective ways, rather than as just a social connection tool. Would you not rather teach students about all the tools and information that is out there and give them access, as well as teach them how to effectively use it to create something big? Students learn from teachers more effectively and will remember a story, or an experience much more than something they read once on a device. So why wouldn’t you want to us this knowledge and power to teach students the “how-to”, the “why”, and teach them to ask questions about the tech world and what they see, and the social do’s and don’ts of society, instead of leaving them to discover it on their own? It all started with an idea, and a need to be able to sew. I knew this skill would serve me later in life and come in handy, then I remembered a pin I made back in my early university days to make a t-shirt quilt and there it was: my brilliant idea for a learning project and I couldn’t have been more excited!! I started off by testing out my hand-sewing skills and after a few trial and errors and re-watching a couple of videos, I felt like I had the hang of it. To begin, I know I was reliant on my mother for reassurance because as noted in other blogs, I am a slight perfectionist…I crave perfection and the idea that I can learn from making mistakes is absurd. If I make mistakes often enough, I will quit. It’s been my nature from a young age, and this project really challenged me to be okay with making mistakes, and learning from those mistakes. Beginning with hand-sewing was a slow and confidence building technique I needed to start this massive project! The great thing about hand-sewing was it was easy to fix mistakes and redo stitches. I was able to do this quite a few times until I felt like I had gained a comfortable understanding of threading a needle, making a stitch, and sewing buttons. Then came the real test. I began my quilting process. I did not expect there to be as many steps as there were and beginning on the sewing machine was terrifying and infuriating. I know when I get frustrated, I need to step away. The sewing machine was frustrating and annoying to figure out, but with some help from Youtube and my mother, I got the hang of the ancient machine. What I don’t think I mentioned in my blogging was that I tapped into my school resources and borrowed a sewing machine from the school. SO MUCH EASIER!!! I am so grateful l did this, as I am confident my quilt would not have turned out as nicely and I would have ran into a lot more problems and would have needed to troubleshoot a lot more. I had to select my shirts, and then cut them all, which was again super time-consuming. It was at this point in the project that I was questioning my idea and questioning whether I would have enough time to finish. I used my grandma’s tools and advice for cutting and interfacing the t-shirts. In this, I also learned that I like to take a lot of different ideas for how to accomplish a task, and work it into something that makes sense to me. I received advice from my grandma, ladies at the quilt shop, and the internet. From these sources, I combined methods to complete my quilt in a way that made the most sense to me. Having advice from so many sources could get confusing, but I also enjoyed having different options and ideas for how to complete this quilt successfully. When I was cutting the t-shirts, I struggled at first with being perfect once again. Knowing what I know now, the edges DO NOT MATTER! I could have saved a lot of time as most of the edges end up as ruffles in my quilt. I also would have sewed the interfacing on first and then cut!! Even when I did make mistakes cutting, I kept going and convinced myself that it would all work out in the end. By the time I started cutting the flannel, I was set! I persevered, and this is not something that I would normally do, but this project pushed me to just keep going and figure out how to fix the mistakes I made. Once the cutting was finished, I feared making mistakes on the sewing. I pinned my flannel to my t-shirts, and I began sewing. It wasn’t even that bad! Again, I needed reassurance that I was doing okay and my mother was a great support to answer every call or she was there just to make sure. This support and reassurance was key to my success because I probably would have struggled more or even questioned my methods has she not been there. I found having a person to directly talk to, bounce ideas off of, and reassure my work an incredible resource and helpful for the success of the project. It wasn’t a constant, “Am I doing this right?” but a gentle “good work” which is what everyone needs on occasion. Once the individual squares were cut, the quilt flew together and I couldn’t have been happier with the way it turned out! It was difficult to sew together because it was so thick but I now I have the coziest quilt to curl up with at night! about it, I figured out why. I was working with t-shirts, but not just any t-shirts. These shirts hold a lot of meaning, and memories for me. If I screwed up, the shirt and the memory was gone. This was a high pressure project because it was SO meaningful for me. I’m grateful I took the risk, but I feel that if I was using regular material, I would have been more relaxed with making mistakes and not as rigid. I learned that I am an independent learner, and I enjoy things I can do on my own that give my brain a break from a stressful day of teaching, as well as challenge me in other ways. It was nice to break routine, and make time to learn a new skill. Overall, I really enjoyed this project and I learned a lot about sewing and about myself as a learner! If you’d like to see the whole thing unfold, here is the link to my project! Until next time! Thanks for stopping by! Here is my finished Summary of Learning Project! It was a lot more work than anticipated, but I only ran into a couple of hiccups in the process! I used Adobe Spark, and I really liked the simplistic layout and the ease to record. My laptop mic wasn’t working the greatest, which causes a lot of re-records so it was nice to be able to do it over and over again until I was satisfied with the slide! The only thing I didn’t like was that I couldn’t place a lot of imagery on the slides unless I created the images myself. The download speed took awhile but that could have easily been my connection. Anyways, here it is! Then came the hard part…figuring out how to put all those squares together! I revisited a couple of my quilting blogs for some advice and guidance. I figured out that the absolute easiest way to get things fitted together was to start by sewing my rows together, individually. This task was actually easier than I thought as I am creating a ruffle quilt. That means messy seams, and mistakes are allowed, and I don’t need to worry about being perfect. I laid out my row, and then took two shirts and placed them back to back to sew the seam. This way, the seam would be in the front of the shirts, and once I’m finished it SHOULD ruffle after I wash it a couple of times. My only concern is that my ruffles are too big. I think I want them smaller, but this also means I need to sit down and CUT (that dreaded word) all the shirt seams down. Right now, I have zero patience for that, so I will decide that later on. I continued, connecting the row of shirts together to get a product like this! I’m super happy with the way it looks right now! USB sticks of information to fellow teachers in my building. If there is ever a need, I oblige and give any of my colleagues what they need, in hopes that one day the favour will be returned if I ever need it. In my short 5 year career, I’ve taught a whopping 18 different curriculums at a high school level. I know, in my earlier years, teachers handed me lots of resources and now it’s my turn to help some young, stressed out teacher play the part. In Sharing: The Moral Imperative, Dean Shareski talks about how it is our responsibility to share these resources not just with our colleagues in the building, but with the world and I totally agree. I think that main reason I haven’t, is because I’ve never actually thought about it! I should. I’ve had many compliments on my plans and curriculum. I’ve made a bunch of “original” projects that would and could be useful to many teachers, especially in Saskatchewan. We discussed in class one night about who owns our lesson plans? Us? Or the division? In some cases, it is the division, but I know in Prairie South, sharing is encouraged and I don’t think I would ever be reprimanded for sharing resources online via Twitter or my blog. I think my personal barriers is thinking that my work will not be of benefit to others, even though I’m sure this is not the case. As Dani stated in her vlog, she didn’t think her post would be noticed even though she should have known better. I feel the same way. I think I get caught up in the idea that the internet is SO big, how would my tiny footprint, make a difference. I also think I haven’t shared online because in my busy day, posting an assignment or idea to Twitter seems irrelevant and like more work sometimes. It’s super quick and easy, but it’s just not something I consciously think about on a day-to-day basis. The benefits to sharing work and collaborating online are incredible! Dean discusses a few examples in his video and the one that stood out to me the most was Dan Meyer’s Math Stories. He put over 18 hours of work into one lesson. ONE. And he felt validated by it because he shared it and had over 6, 000 people download and use it within a couple of weeks. I think as educators, we get stuck in our bubble and in reality, there is SO much information out there that can help ease the stress and pressure on teachers to be innovative. If teachers learn how to use the information, filter through resources and had time to collaborate together, I think there would be a lot more sharing going on. Teachers need some professional development and education geared toward how to share, why it’s so important, and the benefits that can ensue. I think that the younger generation of teachers is a lot more equipped to help this movement become a reality, however I think there needs to be support by divisions and maybe even time in a day, week, or month to collaborate with others in their buildings to help develop a sharing network for teachers. The movement needs to begin small, and with an implementation like that, I think it would be possible to create a culture of collaboration. amazing things can happen. Students can learn more authentically and understand how to navigate social networking sites and be able to filter through information. I’m starting a project with my ELA B30 class as we begin Hamlet. In the past, I’ve struggled to make it authentic and get them to really buy in. I created an assignment after browsing a few websites on making Hamlet relevant. I decided to use social media to help them relate to the characters (with some motivation from this class). I want them engaged so I’ve decided to get them to create character profiles for the whole play. They have the option of doing it alone or in groups and they have the option to interact with each other online as characters or as an omnipresent narrator. Here’s the link to the assignment (also my first attempt at sharing my work online): http://bit.ly/2AYEYJO. I’m pretty proud of this assignment already and I think the students are already engaged with it as I had two new Instagram followers (Hamlet characters) yesterday immediately following me handing it out! I will keep you posted as we progress through the play and I hope to actually share some of their posts if they are good! Of course, I’d love to know what you think of the assignment? Maybe a fellow Senior English teacher like Kelsie could chime in? Anything I could tweak? And what do you think would get teachers more involved in openly sharing resources online? I DID IT! I started sewing! To say I was nervous was an understatement but I persevered! 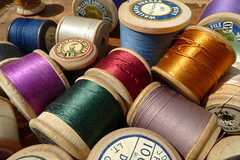 I began by winding my bobbin again with black thread, and then threading the machine. This was much easier than the last time I did it and needed no assistance via videos! I was proud (proof I’ve actually learned something in this)! After finishing the cutting stage, I needed to pin all my shirts and material together – shirt, black flannel, plaid flannel. The goal was to purposely mismatch the flannel pieces so that it doesn’t HAVE to be perfect when I sew it together. If it is purposely mismatched, then less mistakes can be made! I finished cutting. Now I had to pin! Thank goodness, my mom showed up to help!! However, as I began the sewing process, it began clear that it didn’t matter if I tried to mismatch them or not, the plaid is square and it matches anyways. Just the colours of the lines don’t line up and I am fine with that! I think it creates character, and I really did not feel like attempting to line up the plaid in a way that matched on the whole quilt. That would take much too much patience, planning, and perfectionism for this girl! So on I went, pinning my squares together. After a couple, my mother showed up to assist me in the process and to hang out with me while I sewed. She is just as interested in this project as I am at this point. My mom helped me pin the shirts to the flannel and after a while, we fell into a pattern of her pinning the shirts together, while I sewed the squares. I am actually impressed with how easily I managed this week. I watched this video for a refresher on using the sewing machine and to help me sew the corners, and then I was set! I have used a sewing machine before, so I understood how the whole thing works, so I just needed a little reminder on the basics. I knew I needed to create 1-inch seams (as decided previously) around my shirts, so I had a lot of room for error. It was nice to have that reassurance, and after the first couple of shirts, I was rolling. Sewing, pulling out pins as I went, lifting the foot, making sure the needle stayed in, turning my material, and continuing to sew. My lines were even straight thanks to my painter’s tape I had placed on the machine to keep me in line! I managed to get through three rows of shirts rather quickly, thanks to my mom’s help of pinning the shirts! I hope to finish the other three rows this week and then begin the real task of sewing it all together!! I’ll have to check out some resources for how to sew the seams together, without going over the ruffles I’ve created. I might also have to trim the edges of my squares…I don’t know if I want 1-inch ruffles all the way along the quilt yet or not, so that will be this week’s task! This week, we were charged with the task of evaluating an OER (open education resource) and I chose the American Institute of Mathematics since I have been teaching Calculus for the first time this year! I wanted to check it out and see if there are any resources or lessons that could help me on my way to building my curriculum. I was slightly disappointed by what I found. To begin, the homepage is wordy and heavy texted. There are limited pictures and seems more like a mathematician’s website than a teacher resource (which is what I was hoping for)! I did watch a pretty cool video about how mathematicians are working with strawberry farmers to create an optimal profit which could be used to supplement a lesson of sorts, but there weren’t really any teacher resources on the homepage. I began checking out some of the other pages and links and although easy to navigate, there aren’t a lot of resources for middle years or high school students. There is a whole page dedicated to Workshops and a Problems List, however the problems are far above my students’ head as well as my own. It’s definitely a well-organized site but more for a higher level of education than what I currently teach, and as I moved on, I found what I was looking for: the Online Textbook Initiative! Our Calculus textbook was brand new when I was in high school (8 years ago) and it is STILL being used. A new resource would be awesome for my students so I checked them out and was pleasantly surprised. There is an evaluation criteria and it even gives information about the textbook: exercises, solutions, etc. There is a plethora of textbooks to choose from for a variety of different courses and material and although I didn’t look at every one, they do seem to be of high-quality and focused on university course material. This is again, above my level of teaching but might be a good place to check out for my AP course next semester! So although it is a high-quality website with a TON of resources, workshops, and problems, it is mainly a university website which is too bad because I was really excited to find some new resources for my students. I’m sure if I weed through some of it enough, I’ll be able to some examples, and problems for my students to use. But, I was disappointed in the text heavy layout of the website and pages as it makes it much more difficult to read and decipher. The language is definitely for those who understand mathematics and teach it at a much higher level than me. For high school or lower, it would not be very user friendly if you do not “get” the math language! I’m sure it would be a useful website for mathematicians, and university students, especially in terms of finding some free textbooks to use instead of paying the big bucks for them! Open Education is defined as “education without academic admission requirements and is typically offered online. [It] broadens access to the learning and training traditionally offered through formal education systems” (Wikipedia, 2017). After watching the videos this week, I’m all for open education and honestly, I think I always have been – I just don’t think I knew it had a real definition or official term. If I think back to my university days, I was all over Google looking for math help to make it through those tough math courses and I found a lot of help in websites like Khan Academy and Wolfram Alpha. They were necessary resources for me to survive these courses, as well as help from fellow classmates. As I moved into my teaching career, it is very rare I make a lesson or project from scratch. In university, the famous Rick Seaman told us “Teaching is Stealing” and I still believe that to this day. There is no need to reinvent the wheel if there are perfectly good resources online, or in another teacher’s hands. I have taken from the web, from websites like Teachers Pay Teachers, and used videos from Khan Academy as well as my new favourite resource, Desmos. For those of you who don’t know what Desmos is, it’s a FREE online graphing calculator app. No longer do you need to pay obscene amounts of money for graphing calculators and even better, it’s in colour. There is also a plethora of teacher-made lesson plans and graphing calculator activities on this app which anyone can access. I have yet to figure out how to make these activities, but until I do, there are plenty activities there that I can tweak and use for my students. But back to my point on “Teaching is Stealing;” I think teachers should live by this rule. As a beginning teacher, I have survived my first few years by asking other teachers for resources for courses they have taught, and in return, I pass on my resources to other teachers new to the career or a course I have taught. I believe the teaching community motto should be “pay it forward” always! I can’t tell you how many teachers have asked me for resources and I gladly help however I can, because when I need resources for a new course, there will always be another willing teacher to help me out. This is where I feel the “Everything is a Remix” theory fits directly into education (and I need to say, this video series was so interesting and informative; my mind was blown many times while watching). The main purpose of the video series was to break down the barriers of original concepts and make people realize that everything is indeed a remix, even subconsciously. Everything ever invented, has concepts from other places integrated into it, in order to create the completed puzzle. Teaching is the same way. Original ideas are awesome, but in a demanding career, why not remix a resource you find online or from a fellow colleague, instead of spending hours reinventing the wheel only to find someone has already done it? Copyrights. According to Kirby Ferguson, “the belief in intellectual property has grown so dominant, it’s pushed the original intent of copyrights and patents out of the public consciousness” (Everything is a Remix, Part 4). In 1790, the original Copyright Act was intended for the “act for the encouragement of learning” and the Patent Act was to “promote the progress of useful arts.” We have gone so far beyond this, and as humans, we have become selfish. 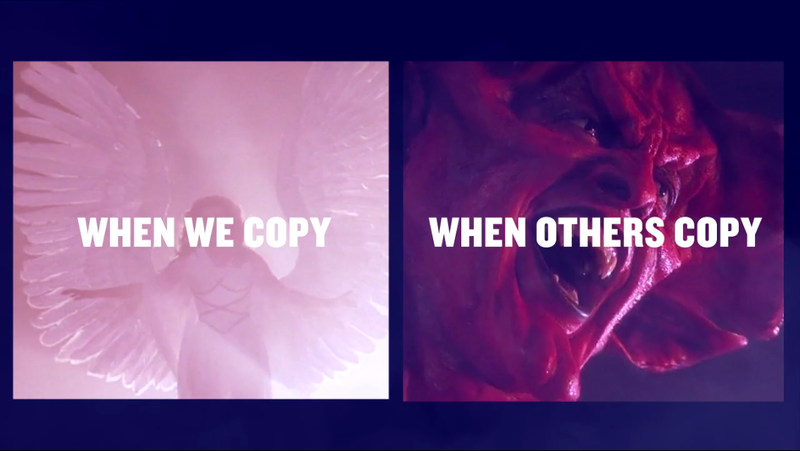 We are fine with copying Ferguson says, as long as what is being copied is not our own. 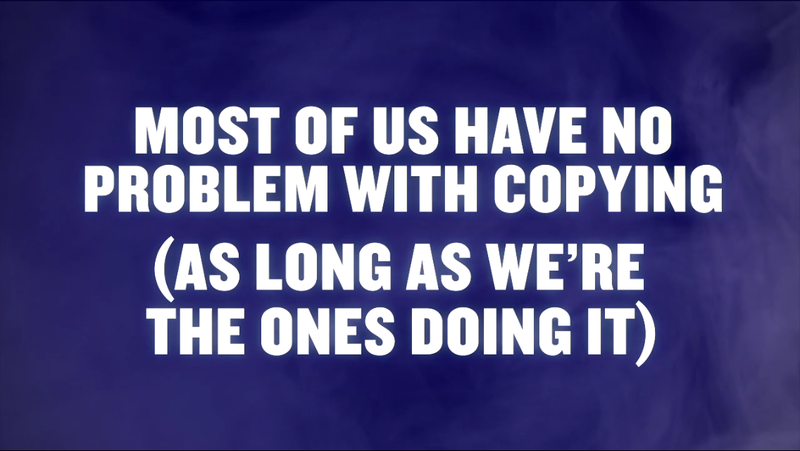 There are constant lawsuits over this idea and as teachers, we do need to be aware of the consequences of copying resources online, if there is a copyright infringement. The idea of open education as a teacher is great, because it gives a plethora of resources that we can freely access without the worry of our school budgets. However, we do need to be aware of where we “steal” things from. The idea of the Copyright and Patent Acts was to “better the lives of everyone by incentivising creativity and producing a rich public domain.” (Everything is a Remix, Part 4). We depend too much on paying for resources, and not enough time taking risks. The idea is to beat the big companies forcing us to pay too much for ideas that should be for the greater good, our students, as Lawrence Lessig discussed in his Ted Talk, Laws that Choke Creativity when comparing the ideas of BMI’s victory over ASCAP in the music industry. So, we need to get back to this idea of sharing before it is too late for our society and we all become too selfish and stuck in the idea of personal wealth over common good. My project is currently at a stand still until I can get to Regina next weekend for some fabric. I could have had someone run to Fabricland for me, but I wanted the experience of picking my own fabric and making sure I liked the colour or if there were more colours to choose from. So, it is perfect that Alec asked us to reflect on our learning projects this week. So far, I feel that I have learned a lot of new skills when it comes to sewing. My knowledge in the beginning was incredibly limited. I barely even knew how to hand stitch something like a button! I now have the skills to fix my cat’s toys, sew buttons back on to clothing, as well as patch a few holes. My confidence might not be incredible, but it’s better than it was. I think a lot of my confidence came from having a person there for immediate support if needed. I could do most of the hand-stitching on my own, but knowing that I had an inspector there for immediate feedback was a nice support. I think of Ryan, and his struggle with crocheting – sewing and crocheting from scratch, with little to no experience would be incredibly difficult to learn on your own without anyone to show you the skills needed. Of course there are plenty of online supports, but having a teacher there in person is very reassuring and helpful, even if you don’t have a lot of questions. When I turned to the sewing machine, things got a little tricky, but I have from some great resources to help me along the way to creating my quilt – I was also recently told that “blanket” is a swear word in the quilting world, so I will now refrain from using it as I am apparently making a quilt, not a blanket. My sewing machine has proofed to be quite finicky so I have opted to use one from my school. The clothing and sewing teacher at Central has kindly offered me an extra sewing machine to aid me in my sewing adventures. I think it’s a good call as my grandmother’s is quite old. A newer machine might be a smarter move right now for my first official project. My next move is to start sewing the flannel onto my t-shirt squares. This needs to be done individually, and then I sew the t-shirts in rows, and then sew the rows together. As I am beginning the stages of actually sewing, I am extra grateful that I do not have to follow a sewing pattern like Marley! She is brave!! And then once the squares are all sewn together, there will be another stage of sewing which involves sewing the entire back piece onto the quilt. There are actually two options for this: cut the backing for my quilt into squares and individually sew the back flannel on so that I have a square pattern on both sides of my quilt OR sew an entire back piece onto the outside edges of my quilt and then hand sew stitches into each corner of the t-shirts. There are 30 t-shirts, and 4 corners per t-shirt. This method is going to prove to be very time-consuming and profanity inducing I’m sure, so I am leaning towards the first method. If there are any quilters out there, let me know which method you think would be best! I feel like I am on track for finishing my quilt before the end of the course. I know this is not mandatory as we are supposed to be learning a skill, but I know myself, and I know that as my year gets busier with the start of basketball season, I will be less inclined to work on this project, if I do not have the external motivation from my fellow ECI 831 members, so my plan is to have a final product by the end of the course. interfacing, while I sat and cut the shirts into the appropriate sizes. It was actually enjoyable with her help as I got to catch up with my mom and be productive at the same time. She was very helpful, and I would honestly has been a great resource up to this point! It’s been a rather smooth process. Once I finished cutting out all 30 shirts, I began the real fun part! Organizing and laying out my pieces. I was so excited to finally have an image in my head of what it will look like as a finished product! I laid them all out and then began moving the squares around until I finally settled on my placement. I may still change a couple of pieces but overall, I like it! What do you guys think?? Any suggestions!? My goal was to spread out the brighter coloured ones as well as make sure I had at least one white, black and grey one in a row or in an area so it doesn’t look too dark. In the process, I ended up kicking out a couple of shirts and replacing them with shirts I either forgot to cut and really wanted on the quilt, or one shirt that is very awkward to cut, so alas I will need to cut and iron three more shirts! I will end up actually cutting it at the side (under the arm) of the shirt, and placing a patch of the front of the shirt in the middle of the square. My next task will be buying the flannel of choice for the squares and the backing! I will probably need to make a trip to Regina to buy the flannel as Moose Jaw only has one store, Quilter’s Haven and I’m not sure on the amount of options they will carry and I will not have time to order some online. Fabricland perhaps? Does anyone know any other places to buy fabric in Regina? This week, we discussed social activism online and whether or not it can be effective. Is it worthwhile? I think it is possible for it to be worthwhile and meaningful if the people that are advocating for the cause are invested beyond just social media. We discussed in class the idea of slackivism. Wikipedia explains this to be the concept that people believe that are contributing to a cause by simply re-tweeting, sharing or liking a page. However, sharing or liking something on Facebook, although a great way to create more acknowledgement towards a specific issue, does not solve the issue. It is a way to share information and give people who actually WANT to create change, a medium to do so. One excellent example I found was Wael Ghonim: a social activist who used social media to help create the revolution in Egypt in 2011. Essentially the movement began with the death of Khaled Said, and a picture that was posted and shared relentlessly on social media. This sparked interest and Ghonim created a Facebook page to support this outrage. He gathered hundreds of thousands of followers; then realized, it wasn’t enough to just gather online. They needed to do something. He asked his users an important question: “Today is the 14th of January. The 25th of January is Police Day. It’s a national holiday. If 100,000 of us take to the streets of Cairo, no one is going to stop us. I wonder if we could do it.” (TED, 2015) And they did it. The video goes on to explain the aftermath and the revolution we know today. I think it is awe-inspiring that something so life-changing began on social media and with one picture. ideologies that we would be okay with our students, our friends, and our families seeing and modeling too! After all, that is our job and yes, sometimes it is hard to remain in this mindset in the heat of the moment, but these rules apply to the real world, why shouldn’t they apply to the online one too? Some shirts laid out for my blanket design! This week was not what I anticipated. I was going to FINALLY start my real project- the blanket. However, things did not go how I planned and this is the first time I questioned both my sanity and ambition for starting this HUGE project! Cutting. Not as easy or straight forward as I thought. I’ve had a lifetime of practicing cutting paper and really, how hard could measuring and cutting out a few t-shirts be? HARD. REAL HARD. Mostly it’s the process that’s difficult It’s time consuming, tedious, and requires a lot of patience which as previously stated, I do not have much of. My week consisted of some more research as to what step to really take next which all began after a conversation with my grandma at Thanksgiving dinner. She told me I could borrow her tools for my little adventure which I was grateful for, but then I got confused. Don’t I have scissors? What else do I need? Turns out, a lot! A lot included a very fancy cutter called a rotary cutter, measuring boards and this material called interfacing. Welp, to Google I go! I had to do some research about this new information. Turns out the rotary cutter would actually make life much easier as I am left-handed and struggle significantly with scissors. It makes incredibly precise cuts and I realized I would need to cut to specific dimensions, which I chose as 14 inches by 14 inches for simplicity but also sizing. Squares are nicer to work with, and the large squares both fit all my t-shirt designs and gives me more room for error (which at this point is very probable). So the measuring boards were to be used to lay out the t-shirts and to cut on, and to make sure the rotary cutter had a straight line to follow! Simple so far, but then there was this mysterious stuff called interfacing. Apparently, it restricts stretching of material which is necessary for a t-shirt blanket as t-shirts are quite stretchy so this is supposed to make things easier for me. Supposed to being the key word. You have to iron this stuff onto the back of the t-shirt before you can sew it all together. So, I have to cut and iron on this interfacing to the middle of my design of my t-shirt without actually looking at the design. Urg. The following two hours consisted of cutting the interfacing, ironing it onto the back of the shirt, measuring a perfect square on the front of the shirt, and then cutting the shirt out on the cutting board. I got 8 shirts cut to my dismay. The first one was shaky and not as straight as it should have been, and I also learned you can’t take shortcuts and cut more than one at a time…(see pictures below). I didn’t expect this part of the process to take such a long time, so I have a lot more cutting to do this week! And then there is the placement of the shirts to do as well. This process is going to take a lot longer than anticipated!! More to come! I think my biggest concern about teaching in the digital age is teaching students properly about social media etiquette and making it actually authentic to their learning. So many teachers feel like it is necessary to teach using technology and social media and end up doing it just for the sake of it. I want to make sure when I am using it that it is actually authentic to the learning outcomes as well as engaging for them. Students know when you are doing something just for the sake of doing something so it is important that the learning outcomes match the media you are using. Another concern I have with teaching in the digital age is the monitoring of the World Wide Web. If I were to implement blogging or social media in my class, I would be most concerned about what I am exposing my students to. What happens if their work gets torn apart on the web? What if it becomes viral? What if an already emotional student gets more criticism than they can handle? Social media is linked to mental health, so now am I responsible to ensure their mental health remains high because I required them to be exposed? How do I do that? Do I need parental permission in order to expose students to a world they already have unfettered access to? Along I have my concerns, it is imperative that we teach students about this digital world because they need to be successful. Pavan Arora stated in his Ted Talk “Knowledge is Obsolete” that “65% of grade school children will have jobs that don’t exist today” (2014). This means that as educators we have a responsibility to teach students not knowledge, because as Arora pointed out, it is obsolete. At the touch of a button, you can access any information you need, so why continue to teach route memorization, when the more important skills are critical thinking, creativity, and innovation? Michael Wesch also made a good point in his Ted Talk, “From Knowledgeable to Knowledge-Able” when he said that students aren’t learning anything in the classroom, they are learning to listen to authority. What is that teaching the generation that will one day be in charge of our world? Everyone has a voice and it is incredibly easy to state your opinion online for the world to see. But what is more important is teaching students to use this voice in a positive manner and learn how to educate themselves with the internet and its abundance of resources. Educators need to teach students how to cite information, how to interpret a good source from a bad source, and how to establish their own networks of learning online. I’m not saying it will be easy, but it is the direction we are headed and as educators, it will be a lot easier to embrace this change, stop trying to teach information and be the “experts” and also students to find their own passion and creativity so they can become their own type of expert in a field that may not even exist yet. So this week for my learning project, I decided to start with the very basics. I’m ignoring the sewing machine until I can learn to fend for myself with a needle and thread. I’m going to be honest, I began this week not even knowing how to thread a needle. However, I persevered and learned on my own; turns out, it really isn’t very difficult and my clumsy fingers were able to handle this minute task. seam in his toy and I could no longer allow him to play with it and tear out the stuffing to his dismay. Originally, I thought, “I’ll take this to my mother and she can fix it!” but with my new task of learning to sew, I took it to her house and said “Mom! I need a needle and thread and I’m going to fix this!” I actually watched a video on threading a needle (yes, this is how armature I am) and then also watched a video on fixing a tear with hand sewing. Both videos were very easy to follow and I am going make sure to check out Stitch My Style for other sewing videos. She has a lot of cool projects that maybe once I am more versed in this sewing world I can tackle! My mom was also a great resource as she helped to make sure I actually was completing the stitch properly and actually completing my mission of fixing this cat toy. I had great success!! Not the cleanest stitching exactly, but it will last until Jax decides to tear it apart and I can fix it again! Feeling incredibly confident in my new-found stitching, I decided I should try some button work. I used thread, a needle, an old tea towel and button. I watched a couple of videos (this one was the best) and had my mom’s assistance waiting on deck but I was successful again! This may not be as hard as I originally thought! However, my mother then informed me that the stitching on the back of the button should be neat. This is what mine looked like…. So far, YouTube has been a great source of videos as I learn much better from following someone else then just reading directions. My next task will be to tackle the sewing machine and learn the basics for threading the needle and perhaps even just turning it on! I found a fantastic blog called The DIY Dreamer with a lot of links to other blogs and I think it will be very helpful with the sewing lingo as well as some basic sewing machine tips! More to come; stay tuned! I remember in grade 8 registering for electives for high school. I looked at my mom and said, “I’ll take foods instead of clothing. You can teach me how to sew.” Alas, this never happened. So here I am, 26 years old and still calling my mother or grandmother every time I have a hole in my jeans, a missing button on my blouse, or a pulled out stitch in my sweater. I have always wanted to learn how to sew, in fact, I have made a couple of pillows before (with extensive assistance from my grandma) but I have never had the time, nor the patience to really learn for myself. I think this opportunity is the perfect way for me to learn how to sew so that when I have kids, I don’t have to call grandma to help me fix my kids clothes or so that I am not 40 years old and paying to take my clothes to a seamstress, because I am incapable of handling a needle and thread. I have always been an independent learner and enjoy learning on my own and teaching myself how to do different things. This means it was very difficult for my mother to teach me when she did try. I will however be giving it another go and allowing my mom to help me with this project as a “mother-daughter bonding experience.” (There will be updates on how much I manage to try her patience over the course of this learning experience). I told my mom I would be learning how to sew for my master’s class and she laughed at me, so we are already off to a good start! I also need her for the resources of materials as well as a machine to practice on however, I do plan on teaching myself a majority of the skills I will need to properly use the machine. I am also hoping to learn a few basics on my own using a variety on online resources and videos, so if anyone has any suggestions of good ones, please leave a comment! My goal for this project is to first be able to fix simple breaks in clothing like a hole or a missing stitch. I would like to learn how to sew on a patch and fix a button. Once I learn how to do these skills on my own, I will be applying them to a bigger project. In high school, I was very active in sports. I have so many t-shirts from back in the day and when I was in grade twelve I decided I wanted to keep them to make a blanket. Well, I still have all of the shirts, and just have never had the skills or the necessary motivation to learn how to make it. I am really excited to finally get it done! I’m going to attempt to first teach myself one skill at a time, starting small and learning the basics one week, then applying them to small projects throughout the semester gradually gaining confidence to be able to complete my blanket. I am hoping to have the blanket finished by the end of the semester, to show as my final assessment piece, however time may affect this as I really don’t know how long it will take me to complete however, this blog gave me some good ideas and steps to follow. If anyone has any suggestions about where to start or resources to share, please leave a comment!